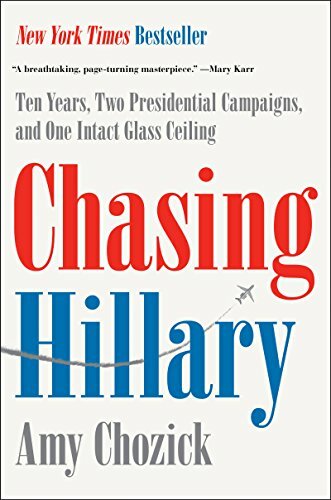 Reliving the 2016 presidential election sounds about as appealing as dental surgery, yet this is what Amy Chozick, the New York Times reporter who covered Hillary Clinton’s campaign, asks readers to do in her book, Chasing Hillary. This smart, driven female journalist’s take on the smart, driven female candidate offers an insider’s look at Clinton’s failings and the challenges of political journalism in the age of social media. Chozick’s incisive analysis, dry wit, and sympathetic voice make the journey worthwhile. In the same vein as Andrea Sachs in The Devil Wears Prada, Chozick arrived in New York City with a suitcase and the dream of being a writer. She even interned at chic magazines on her way up. After several years at the Wall Street Journal, Chozick was hired by the Times, her dream employer. Having covered Clinton’s presidential run in 2008 for the Journal, she snagged the Hillary beat at the Times in 2013 before the next campaign was even off the ground. Chozick describes herself as a fan of Clinton’s who first met Hillary as a teenager when Bill was running for reelection. Full of journalistic ambition and fascination with her subject, Chozick immediately encountered the forces that would shut her out of Clinton’s orbit. Not only did Clinton dislike the media in general, she particularly loathed the Times for what she perceived as historically unfair coverage. Add to that the candidate’s displeasure with a couple of Chozick’s early articles, and Clinton granted her not even one interview over the three years Chozick covered the 2016 campaign. The wall between reporter and candidate took the form of what Chozick calls “The Guys.” These Clinton aides discouraged Chozick from pursuing stories and relentlessly undermined her confidence. They would call and email Chozick after her stories ran to berate her for perceived slights or misrepresentations. “I don’t care what you write because no one takes you seriously,” went one typical comment from a guy. Chozick maintains that Clinton knew about and approved of the service these aides performed. Despite her lack of access to the candidate, Chozick’s proximity to the campaign and all its major players produced some juicy details that politics enthusiasts will enjoy. Her insights about Clinton are particularly thoughtful and a counterpoint to the Clinton team’s portrayal of the candidate as an uncomplicated person with simple motivations. Chozick’s portrait of Clinton brings to life a moody, insecure, funny, devoutly religious, indefatigable woman with a real passion for helping people. She was also, observed Chozick, an inveterate flirt who enjoyed the company of attractive men. The author’s description of the campaign—endless travel to small-town gymnasiums that blurred together to hear the candidate retell the same stories all in the hopes of catching one authentic moment—feels soul-crushing. That Chozick caught Clinton looking like she hated the whole process more than a few times is no wonder. Chozick’s experience as a reporter often sounds just a grueling—competing for bylines, desperate to please her editor, and thwarted at every turn by a Clinton team that disdained her. As she lived and breathed for the next scoop, her health and relationships suffered. As for why Clinton lost, Chozick does not, like the candidate, blame former FBI Director James Comey. Instead, Chozick condemns Clinton for her failure to convey the answer to a simple question: Why do you want to be president? Chozick’s other criticisms include Clinton’s aversion to the media: breaking with years of tradition, she relegated traveling journalists to a separate airplane. Clinton’s old-school fundraising style of hobnobbing with celebrities over six-figure-a-ticket dinners also did not help. One can find plenty of parallels between the author and her subject, both women striving to achieve their career dreams, but they often worked at cross-purposes. The men thwarting Chozick’s efforts to cover the candidate worked for Clinton. Both women were hamstrung by the confines of the campaign: Clinton seemed unhappy in the public glare and less comfortable as the front-runner than the underdog. Chozick’s colleagues at the office often had a better view of Clinton’s events on video than she did on the road, relegated to a back-row seat or excluded entirely by Clinton’s team. We all know how this story ended for Clinton, but Chozick’s telling of the final hours still feel dramatic and moving. While she didn’t have access to Clinton, she did manage to cultivate several well-placed sources who provided great details throughout the campaign but especially on that last night. “They were never going to let me be president,” said a dazed but unsurprised Clinton when she heard the news. One can’t help wondering if Clinton will read this book, and if it would change her understanding of “what happened.” If nothing else, it would finally acquaint her with this reporter she ignored, who was tough on her but still, even now, holds her in great esteem.